Let music and guided imagery be an effective part of your pain management program. Sound Healing: Ease Chronic Pain, Book/CD, with original piano solo music and spoken word guided imagery, is a supportive and comforting self-help tool to for pain relief. These two natural healing therapies are an alternative to pain medication. The Sound Healing: Ease Chronic Pain book explains step-by-step how these techniques work and how to use the CD to help relieve pain, along with a lot of other information and useful tips to help reduce your pain level. It also features a journal where readers can record their progress, and their feelings. The CD offers special relaxing music designed to influence the biological responses that can trigger healing, followed by a soothing spoken guided imagery to bring listeners to a meditative, pain-free state. Sound Healing: Ease Chronic Pain is available for a discount. See below. Listen to Sound Sample of the healing music and the guided imagery. Please be prepared for the “entrainment” transitional effect of this special music. Click here for high quality images of the book/CD and the authors. Helpful for Many Types of Pain. Sound Healing: Ease Chronic Pain is helpful for many types of pain, including: headache pain, back pain, knee pain, lower back pain, joint pain, arthritis pain, hip pain, neck pain, chest pain, leg pain, stomach pain, shoulder pain, heel pain, abdominal pain, upper back pain, kidney pain, breast pain, pelvic pain, muscle pain, eye pain, wrist pain, elbow pain, groin pain, arm pain, ear pain, phantom pain, phantom limb pain (PLP), surgical pain, pain from surgery, tooth pain, toe pain, headaches, muscle spasms, cancer pain, fibromyalgia pain. Sound healing and music therapy are not cure-alls but should really be included in your medicine cabinet as part of your pain-reduction program. Sound Healing: Ease Chronic Pain Chapter Headings. You often take cough medicine because you know it will bring relief from your symptoms and discomfort, even though you don’t like the taste. 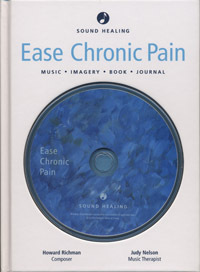 The music on the Ease Chronic Pain CD is like music medicine. It is not a taste you recognize or necessarily enjoy, but you try it because you know it will make you feel better. Music to Ease Chronic Pain follows the musical entrainment process for the optimal results in helping you with your pain relief. The music starts out by mirroring your current pain state and gradually shifts to an enveloping, warm nurturing and comforting state. You are carried along with it. The sound waves themselves have a force that can help relax the blocked energy that may be associated with your pain. Some of the sections of the music are repetitive in nature. This minimalistic approach to repeating a musical pattern may seem odd until you begin to understand and actually feel the hidden benefit. The repetition is intentional in order for the musical passages to resonate in the areas of your being where you have the most pain — just like fingers kneading a sore back during a massage. Guided Imagery Helps “Image” Your Pain and Set it Free. The guided imagery component is designed to help you develop the power of your mind over your body by focusing on your thoughts. The words will help you paint a picture of your pain in your mind, then visualize it as images, light, color, and energy moving throughout and then out of your body. You will feel totally relaxed. The exercise will help you release tension and stress, and experience reduced pain or even a pain-free state. As you experience the imagery repeatedly over time, you may gradually deepen your ability to use visualizations to achieve more voluntary control over your pain. About the Creators of Sound Healing: Ease Chronic Pain. Judy Nelson, M.S., CCC-SLP, MT-BC, is a board -certified music therapist and speech pathologist and founder of the Music Therapy Wellness Center at California State University, where she is an associate clinical professor of music therapy. She also teaches meditation, guided imagery, and stress reduction. stress management, addictions, anxiety and panic disorder, circulation, heart disease, insomnia, pain management, smoking cessation, TMJ and sound healing.